BANGI , Oct 10, 2013 – The employability of Malay-speaking graduates is still good if their command of English, which is dominating the corporate and business world, is not ignored. That was the consensus at a National Language discourse organized by the Institute of the Malay World and Civilization (ATMA), UKM entitled ” Malay speaking Graduate’s Employability, ” here today. Bank Islam Malaysia Bhd General Manager ( Strategic Relations) Datuk Wan Ismail Wan Yusoh said knowledge learnt should be used at the workplace and language is the medium to acquire and apply the knowledge. Datuk Wan ismail explained it is important to learn a language to acquire and apply knowledge. The same goes for the national language as every Malaysian should be proud to uphold the identity of the national language. However, he cautioned, without the proficiency of the English language , it is difficult to conduct business practices , particularly in the corporate and business world. Hj. Burhanuddin Md Radzi, Managing Director of Les ‘ Copaque Production Sdn Bhd, which manages the famous animated cartoon production ” Upin & Ipin ” also gave his views. Burhanuddin said, “Graduates will struggle to market themselves in the workplace if they are not fluent in Malay and English” . Knowledge that you acquired will go to waste if you could not convey them through words,” he added. He said in the cartoon series ‘Upin & Ipin’ , English is not mixed with Malay, except for the word ‘ marvelous ‘ to instil pride of identity among children. In addition he said, “When the series Upin and Ipin was marketed in Indonesia, the television channel requested permission to translate the series in the Indonesian language, but I did not agree to do so because the humor found in the cartoon will be lost if translated “. At the same English is important because it is a global language. 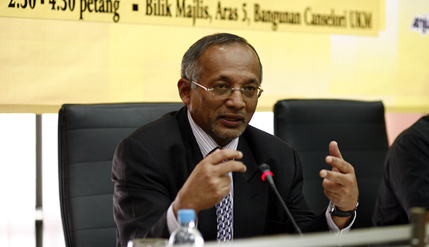 Prof Emeritus Dato’ Dr Nik Hassan Shuhaimi Nik Abdul Rahman , Principal Research Fellow at ATMA , was of the opinion that 90 % of graduates’ employability depends on personality, mentality and the way they carry themselves in the job market later. He said to have those criteria one must have good command of the language preferred by an organisation.